The Model 928A Power System Multimeter with Floating-Point DSP™ Digital Signal Analysis is an AC Power measurement instrument, providing outstanding performance and flexibility in a small, hand-held package. Not only does the Model 928A measure basic data and power quantities, but it also measures power quality including harmonics, flicker, sags, surges and interruptions. Incorporating a graphic LCD display, serial communications, real time clock and an unprecedented combination of features makes the Model 928A the ideal instrument for the power professional. For current measurements, Model 928A works with several Arbiter external Current Transformers available as accessories to the unit. 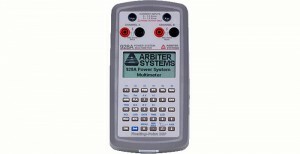 Configuration Note The Arbiter Systems®, Inc. Model 928A Power System Multimeter™ has two identical measurement channels, Channel A and Channel B. Each input channel has a voltage input and a current input. Current inputs are intended for use with external CTs having a nominal output of 0 Arms to 1 Arms or 0 Vrms to 1 Vrms. For basic measurements (voltage, current, frequency, and phase angle) any combination of inputs may be used. For power and energy measurements (active power, apparent power, reactive power, and power factor), one voltage and one current must be selected.